Our Neck of the Woods: Christmas Cookie Tag! 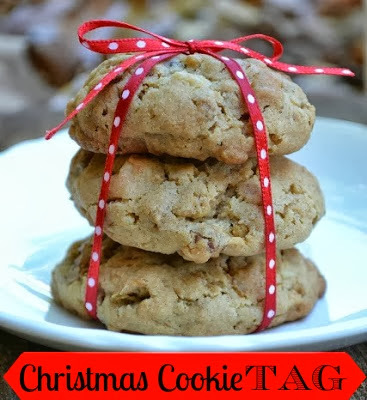 Instead of my usual Feathered Friend Friday post, I wanted to let you know about a new series I will be participating in - Christmas cookie tag! The gang that brings you the Homemade Living series is teaming up to share 12 delicious cookie recipes to inspire your holiday baking. The series will start next Monday, so don't forget to check in and see what recipe will be shared that day. Read on to learn more! Remember the days of tag? When you'd run and run and run, trying to avoid the one who was it? How you'd get sooooo close to being caught and you'd arch your back to just squeak by without being caught? And then you'd run *just* a little closer to the "it" person, but never close enough to actually get caught. You'd spend your whole recess trying to be safe. And you'd celebrate with tired legs and rosy cheeks if you made it the whole recess being safe. Well, we have a new type of tag for you. But with this one it is FUN to get caught and you MUST get caught. Because what we have to offer you is so delicious that you wouldn't want to NOT be caught. That's right. You want to be caught right in the middle of our Christmas cookie baking game of TAG. Whoever is "it" bakes cookies and posts the recipe for everyone to enjoy. And then she tags the next blogger, who will also be in charge of baking and adding a recipe to our TAG game. And she'll tag the next. And the next. And the next. And before you know it, we'll be up to our ears in delicious cookie-ness. Cookie-ness is the very best state of being during the holiday season. Cookie-ness really ought to be a word. And now I'm hungry. Up first next Monday, December 2nd is: Jackie from Born Imaginative! We'll be tagging each other for the next three weeks bringing you 12 delicious cookie recipes for your Christmas holiday. We hope that you check back with us to see who's going to be the next "tagged" person! Nice picture of your cookies with bow. I can't eat 'em....but that doesn't stop me from looking and baking for everyone else!!! What a fun idea - and I love that cookie stack! Yummy! Sounds like fun! Looking forward to getting some yummy recipes... Blessings! Very cute :) and yummy looking! Yeeeesss! I love new cookie recipes, so I am VERY excited about this! Sounds like yummy fun to me. Delicious ! I love sweet cookies. We do a family cookie baking day that is crazy... seriously crazy, we bake a dozens of cookies. Have fun with this, sounds great. Now, I will wish I had more time to bake cookies! My family and I do love to eat them. Have fun with your Cookie Tag! Wishing you a happy Sunday and week ahead! I saw this on Jackie's blog. So pumped for all the cookie recipes! Yummy! It's fun to collect cookie recipes!! This will be fun and help to prepare for the holidays with friends! !